The transition from the lower to the higher class is achieved by winning in the special boss tournament event. Besides the players, various AI simulated drivers engage in events and challenges. All AI drivers are simulated according to their parameters and settings. Computer opponents can progress and improve their vehicles in a way similar to the player's. This provides an additional reality aspect for the whole game. For each category there is an official rank roster which shows the current positions for all the drivers. Standard types of events/challenges are races, knock-outs and tournaments. Some events have prerequisites that have to be met before participating in the race (specific class, car type, car color, type of weapon allowed...). The Hammerhead Bundle is the latest ferocious collection in Indie Royale’s on-going quest to bring you the hottest and most interesting indie games out there in the wilds of underground development. This week’s bundle is worth in excess of $70 when purchased separately and brings together Primordia, Pressure, Forge, Richard and Alice and Gas Guzzlers: Combat Carnage. Wadjet Eye’s Primordia is a modern adventure game set in a far distant future where humans are extinct and robots rule the world. Described by the magazine Games Master as “a throwback to the genre's glory days” this smart, philosophically minded journey sees you accompany Horatio Nullbuilt and his sarcastic helper Crispin as they attempt to fix their starship in order to leave the planet. With humorous, intelligent writing and a striking art style, Primordia offers an adventure everyone will want to chase through to its dizzying conclusion. Primordia is available for Windows on Steam, DRM-free & Desura. By combining an over-the-top arcade-style racing game with shoot ‘em up mechanics, Pressure is, as one critic put it, the “2D shooter evolved”. Set in a vibrant steampunk world, you play as Morgan, tasked with collecting and returning water to his river after it's been stolen for use in a "uber-spa" by the evil Count Soap II. Race through checkpoints destroying enemy vehicles in order to keep your ‘pressure’ gauge filled as you compete across 30 levels. A local and online multiplayer mode allows you to team up with others in this unique and comical blend of game styles. Pressure is available for Windows on Steam, DRM-free & Desura. Forge is an online, class based multiplayer shooter set in a distinct fantasy universe. Forge features only the best aspects of MMO and FPS class based combat to provide a multiplayer gameplay experience unlike anything you've played before. Armed with a set of powerful and unique abilities as well as a powerful and deadly ally, each warrior must overcome the varied challenges of Forge where every kill is a sacrifice and every sacrifice brings them one step closer to freedom. Forge is available for Windows on Steam. This minimalist tale of two prisoners trapped in an underground facility was described by Destructoid as “thoughtful, slow-burning [and] poignant.” Through a series of affecting conversations, the pair -- one of whom has been incarcerated for murder, the other for deserting the military -- open up about their backstories drawing one another, and the player, into their lives. At the heart of this often bleak, melancholic game lies an appealing warmth, one that stays with you long after the story is concluded. Richard and Alice is available for Windows on DRM-free & Desura. Take to the open road in Gas Guzzlers: Combat Carnage, a fast-paced 3D combat racing game that features a host of different vehicles, weapons, upgrades, on-track bonuses as well as distinctive and highly detailed environments. Start your career with a beginner’s performance vehicle and work your way up the rankings by earning money in a series of challenging races. Along with developing your driving and fighting skills, you must invest your hard-earned money wisely in order to maximise your chances on the track. 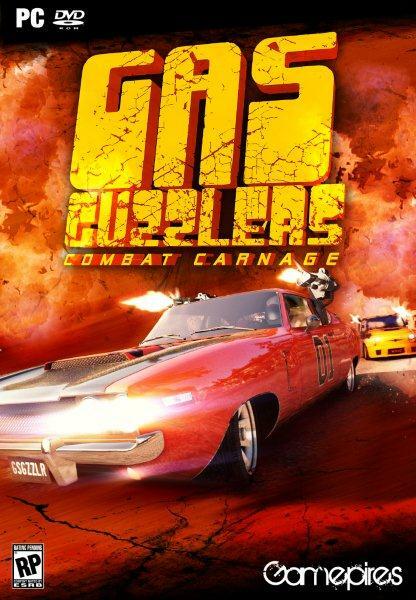 Gas Guzzlers: Combat Carnage is available for Windows on DRM-free Desura. You can find more information on The Hammerhead Bundle, including real-time statistics and its current price, on its official website or via its Facebook, Twitter and Google+ pages. As ever, the bundle is cheaper the sooner that you purchase its (unless, of course, some kind purchaser opts to lower the price for others) although there is tremendous value here whatever price you pay. So, we bought it in alpha, they release an "improved" version on Steam and we get forgotten?. Nice customer support Devs. I play demo, and I feel like the game has some kind of steering 'help'. I want to disable this, but I can't find it. i didnt really pay for this game, but everyone that did and supported gamepires before should get a free steam key for the new version. The publisher is new for Gas Guzzlers Extreme, but the devs are the same. That's not the same game at all. EXTREME version also use a completly custom made engine rather than UNITY. So, do we have to pay again to have this game on Steam? Will there be steam keys for us, please? I looked it up.. and stuff. appearently. On Steam "Gas Guzzlers Extreme" is an updated version of this game here. Due the update is using VAC it looks steam only. therefore this here will stay outdated? I would Understand a DLC as upgrade and like some other games just getting a Steam key would be enough..